If then this light, which shone from the Saviour on the Mountain, is a natural symbol, it is not so in respect of both the natures in Him, for the natural characteristics of each nature are different. This is very telling, as 1.) it affirms Chalcedon, and 2.) shows the historicity of the Orthodox Church’s orthodox Christology as defined at the Fourth Ecumenical Council–very telling indeed, especially in our present-day when both of the preceding points are under attack, and not just by heretics, but by many Orthodox as well. This could be seen last year when the blog Orthodoxy & Heterodoxy published a brilliant, insightful and historically accurate post by guest author Nicholas Marinides, Ph.D., entitled Chalcedonian Orthodoxy and Non-Chalcedonian Heterodoxy. Not only did Fr. Andrew Damick opt to add an ‘Editorial Note’ preceding the ‘Comments’ section, but the post has since been updated with links to two follow-up posts which I have not yet had the time to read, due to training jiu-jitsu and being a full-time seminarian in a different province than my long-suffering wife. The post itself obviously is not what I’m referring to when I wrote above ‘this could be seen last year,’ but the comments section, as those who are not embracing the Monophysite/Miaphysite heresies with open arms could easily guess. Indicative of the mindset of those posting in the comments against Dr. Marinides is the fact that a couple Orthodox Theological Academies embrace the same mindset, as I will show in a “Prequel” in this series. I sent a link to the blog post to my Spiritual Father, as he (in addition to being a Professor of Pastoral Theology in a seminary) is in an unusual position as he not only has his M.A.Th. from one of the pro-Miaphysite Orthodox Theological Academies but is also a Lecturer at the other. His response? The above is really unsettling, and the whole situation confusing, to those who attempt to fight the good fight, to keep the faith—but don’t lose heart, we have a miracle showing us the way in which we should proceed: the miracle of the Holy Fire, which as of this writing has already been granted to the Chalcedonian Orthodox faithful who gathered at the Holy Sepulchre today. Once the Armenians (monophysites – ed.) 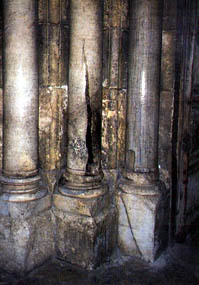 paid the Turks, who then occupied the Holy Land, in order to obtain permission for their Patriarch to enter the Holy Sepulchre, the Orthodox Patriarch was standing sorrowfully with his flock at the exit of the church, near the left column, when the Holy Light split this column vertically and flashed near the Orthodox Patriarch. A Muslim Muezzin, called Tounom, who saw the miraculous event from an adjacent mosque, immediately abandoned the Muslim religion and became an Orthodox Christian. This event took place in 1579 under Sultan Mourad IV, when the Patriarch of Jerusalem was Sophrony IV. Keep this in mind when in a few hours we ourselves receive the light from the flame of the sleepless lamp on the Holy Altar in our parishes, lighting our Paschal candles from it as we receive the light from the unwaning light, and glorify Christ Who is risen from the dead. Recall at that moment when the Holy Light split the column, lighting the candle of the Chalcedonian Orthodox Patriarch Sophrony IV, and not the candle of the Miaphysite Patriarch.